Merched Chwarel - Ddim yn Dawel. On June the 10th, 2018, hudreds of women will march together in all 4 capital cities of Britain to mark 100 years since the Women’s Suffrage movement finally achieved their goal of votes for women. (Votes yes. Equality, presumably, will catch up in time) PROCESSIONS 2018 is commissioned by 14-18-NOW, the UK arts programme for the First World War Centenary. Merched Chwarel will be attending PROCESSIONS in Cardiff, raising a banner and representing the women of quarrying communities who’s voices have been silenced by HIStory. 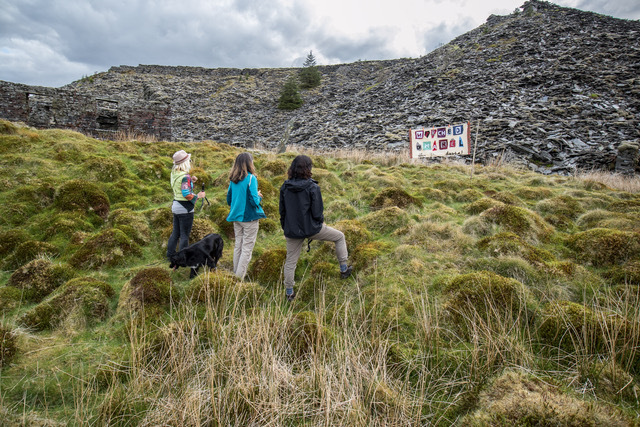 In the spirit of the Merched Chwarel of the past, present and future, four of us and Pwdi the dog, walked to Rhiw Bach quarry village to make our banner. Merched Chwarel on the move! Absennol? Did any women at all work in the quarries? Merched Chwarel and Walking Women : Getting Back into the Rhythm.